Take your church through a four-week sermon series on the four profound thoughts that follow the flow of the message in Conspiracy of Kindness. The idea of Servant Evangelism is best launched as you teach this sermon series while your people read this book one section at a time. 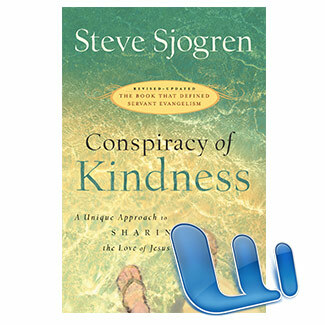 These messages (outlines and transcripts), composed by Steve Sjogren, have been compiled after training many tens of thousands of people who were previously convinced they were incapable of ever connecting with others who didn't know Jesus. These transcripts are Word documents compressed into one ZIP file. Windows users can use WinZip to uncompress the ZIP file, while Mac users can use StuffIt Expander to do the same. After your purchase, you will be able to download these transcripts from your Account page in the order in which you purchased them. If you have any issues, please contact us.